I really wish that more power metal bands would employ the style that Nicta uses on their ‘Rage And Fury Fed Us’ EP. Nicta realizes that power metal can be melodic and emotional without being absurdly cheesy and effeminate. The four (lengthy) tracks on this EP are an extremely promising release from these Italians, and I’m very interested in seeing what they will offer in the future. Nicta has managed on this EP to combine the various branches of power metal into a single musical force which uses its natural variance to its strength, not its deficiency, like many other bands. The material here is not only emotional and catchy, but heavy and intense as well: the latter factors being elements woefully missing from the majority of power metal these days. Keyboards and guitars are roughly on equal footing here, though the latter is clearly the simpler instrument, relegated primarily to rhythm (with the bass deepening the melodies) while the keys form the overarching melodic sense for the music. The vocals here are an extremely strong part of the overall compositions, alternating between melodic but powerful cleans and some black metal influenced unclean, adding both variance and a bit more abrasiveness and inaccessibility to the music as a whole. A good musical comparison here would be to a much heavier, rougher form of the music one would hear on Sonata Arctica’s ‘Winterheart’s Guild’, with a similarly wintry atmosphere (opener ‘Civil War’ actually sounds like Christmas music at moments) and sonic delivery. The instrumentation is very tight, as to be expected, and the songwriting is top notch throughout. Despite the high importance of the keyboards in the overall soundstream, they’re never cheesy, with sounds chosen tastefully and melodies being epic and not unnecessarily complex. The subject matter of this music is a great deal less fantastical than your average power metal band, and the music shows it. Very little is overblown on the tracks here, almost in the style of USPM artists such as Jag Panzer, with tracks that are epic, but not in the style of Rhapsody. This is certainly a great deal rougher than most power metal; vocalist Fabio Valentini sounds genuinely aggressive, despite maintaining some level of melody even during his harsh vocals. In fact, the overall intensity of this music is quite high; all the instruments are played not merely technically, but with a certain percussiveness and sense of speed that seems more fitting in death metal than this genre. Each track is solid in its own right, but the immensely catchy keyboard melodies of ‘Civil War’ make it the best in my mind. However, gems in sections exist on the other songs as well, such as the militaristic delivery of ‘Frozen Sleeper’ or the strangely bitter and sardonic vocals of ‘Set The Fury Free’. 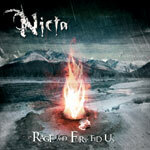 Nicta has captured my interest greatly with ‘Rage And Fury Fed Us’ with their brand of aggressive power metal. For those not typically attracted to the genre, I would recommend you give this band a look: by eschewing many of the stereotypes of power metal, they’ve managed to craft something unique and intriguing while still fulfilling the most crucial expectations of the genre. Excellent music all around. Now this is once again an interesting little demo recorded by this Italian act. Nicta already visited once or twice or reviews page and what we get here is their brand new demo-work. Nicta play gothic black metal in a power metal style with a huge heavy metal background. Strange isn’t it??? and what this actually means is that the Italian five pieces mixes elements coming from the gothic wing of the black metal music (Cradle of Filth, Illnath…) with pure power metal guitar melodies. Very eclectic and I just can’t make up my mind about them, whether they are genuinely talented song-writers (they are without any doubt very talented musicians) or just a band that try to catch as many attention as possible. They also employ a large amount of vocal approaches which works perfectly with the different musical genres delivered. A well played, brightly composed four songs demo with plenty of variety that shall delight a very large array of listeners. 'Rage And Fury Fed Us' is the very promising third demo of Italian melodic death metallers Nicta. The four songs (with an average length of seven minutes) leave quite a positive impression, especially the keyboard parts of Graziano Ferracioli are very inventive and original. The music can be best described as a combination of Crematory, Dark Tranquillity and Moonspell. Atmospheric death metal featuring gothic influences and some power metal as well. The songs are very well composed and although they are very lengthy they do not annoy one single moment. Especially the opening song 'Civil War' is a great keyboard dominated song with surprising melodies. The leading roles on this demo are the above mentioned keyboard player as well as lead vocalist Fabio Valentini who has a light grunt, but who also uses a melodic clean voice, which is a positive thing in this genre. 'Rage And Fury Fed Us' is a very well produced demo and has a very mature approach. Two aspects that will make it easy for Nicta to score a record deal in the near future. Coming from a different musical directions, all members of Italian newcomer Nicta added an own contribution in the total sound of the band. Originally started back in December 2001, and having the intention to play a mixture of melodic and aggressive metal, the band had its share of bad luck in finding a stable line up. Members came and went, all adding a part of the musical direction and crawling through the demo period, we can now declare that the band is ready and loaded for their next mission! A few promo CDs were recorded and spread, which resulted in raving and flattering reviews in mainly Italian press, but as well opening foreign metal portals of magazines and enduring international exposure. Nicta succeeded were many other bands failed: they maintained high quality metal, supporting those releases live, and evolved in their writing process. The band shared the same stages as U.D.O., Vader and White Skull, but didn't rest on their laurels, so they invaded festivals as well: Valpolicella Metal Fest and Metal Invaders 05. Between August and November 2006, the band recorded their new mini CD ''Rage And Fury Fed Us'', which is available since January 2007. A total of 4 new tracks can be found, and they all indicate that the band increased their maturity and equip with a natural stylistic evolution. The band is ready for their next goal: gaining interest from a record label and gather a contract for the next mission. I guess that this is only a matter of time.... From the very first seconds of ''Civil War'', the track that opens the mini CD, the UK band Bal-Sagoth popped up in my head. The same cinematic and theatrical constitution musical wise, but no Byron on vocals. Nicta has a very powerful throat in their line up and Fabio Valentini makes the big difference with Bal-Sagoth. He's capable to sing with a diverse and varying throat, and the attractive part starts in the middle of this track when Fabio is changing over to a melodic power metal voice. Great !! The same quality continuous in track 2 ''Frozen Sleeper'' that takes almost 9 minutes and delivers an oriental intro part, combined with a pounding rhythm section that pushes the song to a higher speed. This time, whispering vocals announce that the track can explode every second which obviously happens after 1 minute! A lot of breaks, hooks and changes characterize this track that need a few spins to explore the entire song. Nicta is a band with a lot of quality and craftsmanship and all songs have the perfect vibe and feeling to take you by the throat. After a lot of spinning in my player, it indicates that the band stands tall without getting bored. Track 3 ''Blossom Of Pain'' is speedy too and again the breaks and hooks are present during the 8 minutes that the song takes. Believe it or not, but I checked several times if the band consists of only 1 vocalist! I really hope to see the band on stage and do hope that they will succeed in delivering a full, heavy sound with just one guitarplayer. On the disc, there are a lot of keys to be discovered, and that might fall short during the live gigs... Perhaps a second guitarplayer might strengthen the total live sound and support Nuccio Cafa (guitars) and Graziano Ferracioli (keyboards). Fans of Bal-Sagoth, Oceans Of Sadness and similar bands need to check Nicta as well! Those that want to discover something new and very promising need to get in touch and order your copy! All necessary info can be obtained at www.nicta.it and you won't be disappointed!